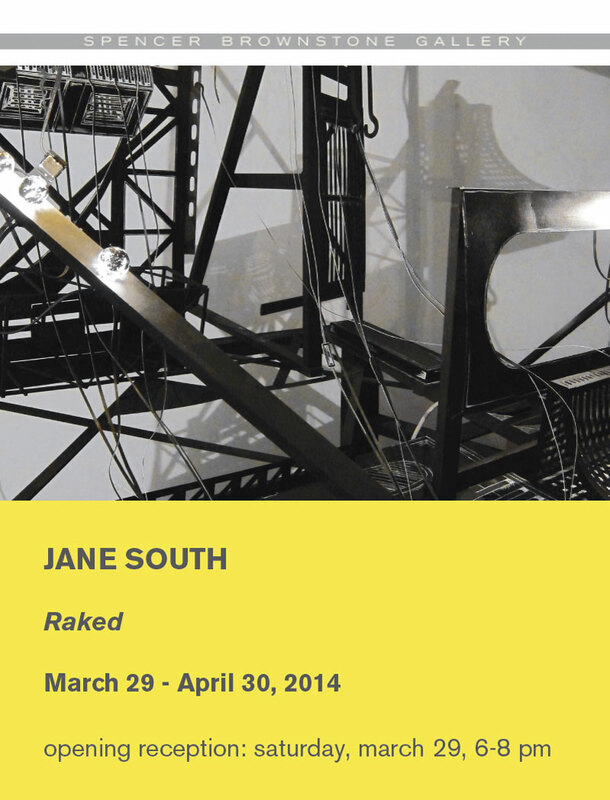 Spencer Brownstone Gallery is pleased to announce Raked, a major new installation by Jane South. As in her previous series Shifting Structures, in which South reconfigured her large-scale installations according to the specifics of site, Raked is a continuation of her most recent work Floor/Ceiling, at the Aldrich Contemporary Art Museum in Connecticut (2013). Described by the artist as an 'epilogue', Raked is a new, site-specific installation which builds from the Aldrich work while continuing to mine the theatrical references that inspired it. However, whereas the suspended platform of Floor/Ceiling alluded to a lighting grid awaiting the potential of a performance, in Raked the loft structure has been reconfigured as a "stage" upon which the components are haphazardly strewn–exhausted and played out. In theater, the term 'raked' refers to a stage that is sloped down towards the audience to facilitate a clear view of the action. Upon entering the gallery, like theatergoers, visitors are confronted by a structure that implies impending action. This stage however has no set or actors, but is populated instead by a tableau of the artist's characteristic hand-cut and drawn paper sculptures. The raked plane also visually and physically destabilizes: these objects seem to have tumbled down it and come to rest. Light comes from bulbs located within the work; their capacity muted and ineffectual, heightening the impression that we are witnessing something whose function is spent. Walking down a narrow space alongside the sixteen-foot long "stage", the rake rises up to five feet, and the viewers' relationship to the work, both physical and optical, shifts. Shadows cast by the numerous grates, cables, apertures and supports create a mysterious and intricate tracery across the walls and floor. The overt physical presence of the work now mutates into a diffuse optical confusion of two and three dimensions, a compelling contrast that–akin to the "above" view of Floor/Ceiling–affords the viewer an atmospheric glimpse "behind the scenes". In addition to the installation, there will be a selection of works on view from the artist's ongoing series, Flats. As the name implies, these wall pieces are the two-dimensional analogues of her three-dimensional practice. The result of deeper examination into her sculptural work, South manipulates images taken in her studio to produce the complex patterns of intersecting lines and planes which comprise each piece. Through a compression of space, the Flats become Escher-esque; neither conforming to nor producing what might translate into a viable structure.